Being a novice when it comes to video production and editing, creating my first internal communications video to be seen by everyone at Aframe was definitely going to be a real learning experience for me. What follows is a beginner’s guide to video editing, based on my own trials and tribulations of producing my first internal communications video. Working within Aframe’s Tagging department (located in Rainton, which is 271 miles from our London HQ), constant communication is essential. This calls for regular updates to be sent to the main office, and being a video based organisation, it was only a matter of time before my internal communications evolved from emails and reports to the medium of the moving image. The time for the transition came at the end of 2015 with our department’s review of the year. As my video message was going to coincide with the UK release of The Force Awakens (December 17th) I decided to ride the wave of hype and produce a Star Wars themed video of the Tagging department’s achievements in 2015. Firstly, why video? When seeking maximum engagement from your colleagues, video can offer something more than other traditional forms of communication – It can convey your message in a more entertaining way and who doesn’t want to be entertained? Plan your video – Write down your ideas and create a basic structure. Order the sections within your video and use different images/backgrounds and music to emphasize the change in tone and mood. If you have a theme to your video then try and make it relevant to your message and make sure you have a definite beginning and end. When choosing your editing software consider whether you can do what you need with free software. Virtualdub, iMovie and Lightworks are all worthy editing programs but do have their limits, for example the free version of Lightworks will only allow you to export your video with a maximum resolution of 720p, If you plan on exporting to a higher resolution then you’ll have to put your hand in your pocket. For me, having previously attended a short beginners course in Adobe Premiere some months earlier, it made sense to stick to what little I knew. Ask for help – If you are struggling with a particular problem there is an online tutorial out there to help with virtually every issue you will come across when editing your video. You will find these mainly on YouTube (Where I found a tutorial for the feather wipe) but it’s also worth having a look on Lynda.com. Failing that there are a number of editing/Premiere groups on Linkedin where you can ask for advice. Music – The correct use of music can add great value to a video. Use your soundtrack as a framework to build on and hold your video together. Hit the beat with your image transformations and use the accents in the music to do something visually interesting. Using sound effects to add ambience is also important, I added various samples from the Star Wars film at key points during the video to bring certain moments to life as well as music from the film. There are numerous options when it comes to exporting your video from Premiere, the format that you choose really depends on what you plan to do with your video. The best option for playback over the web, which was my plan, is the H.264 codec. I then selected 720p with a frame rate of 25 from the presets. Video Hosting Sites – Not only was YouTube not an option due to the issue with the soundtrack, but because of the public nature of the site it wouldn’t have been an appropriate tool to host a video with confidential client and employee information. The copyright problem would have also surfaced with Vimeo, so even though Vimeo have the option to password-protect your videos for an added level of security, it wouldn’t have been an option for me. The free Vimeo plan also has an upload limit of 500MB per week, so again, was limiting due to my video being 792MB. I eventually opted for Wistia as a hosting site. Due to the confidential information in the video it was essential to use a private platform and there is no upload limit per video in their free plan, only a limit of 25 videos per account. Record Your Viewing Figures/Clicks – Keep a record of email clicks and views using an email tracker and the analytics tool on your video hosting site. Create a call to action at the end of your video that encourages your colleagues to watch till the end and participate with the appropriate response. Your video will then be shared among your co-workers which will equal more views. Overall, this was definitely a worthwhile and rewarding experience for me, there was a lot more work involved than with a general email though, so I think it would be wise for me to find a compromise throughout the year between email and video for internal communication. The call to action (which was a pun based game) led to a great feeling of community and camaraderie within the company, all leading to increased engagement, which in turn led to a great sense of personal achievement. 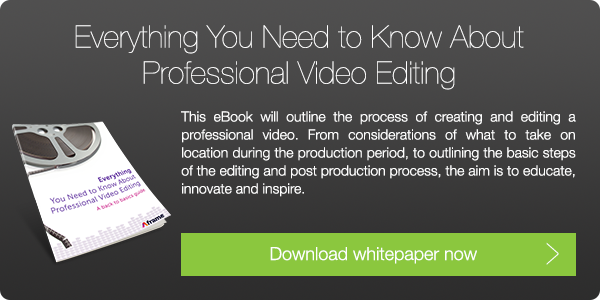 For a more in depth look at video editing check out our pro editing guide below.